Photos #1 & 2: Palm trees allowed to grow naturally. Notice the graceful shape. Not only are they beautiful; they also provide habitat for bats and other essential wildlife. And shade for everyone! Photo #3: Palm trees “neatened up” by humans. “Landscaping Gone Bad,” I call this. Some folks do this so they won’t have to trim their trees as often. But then you have to put up with a whole lot of ugly for those months that the crown is growing back (if it even grows back properly, which it often doesn’t). 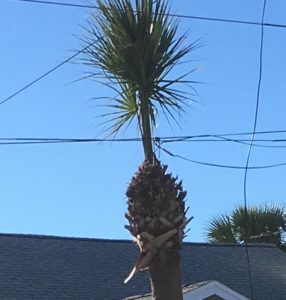 And the thing is, the palm trees really don’t need trimming. They don’t need ANY human intervention at all. They are self-maintaining; they shed fronds naturally from time to time. 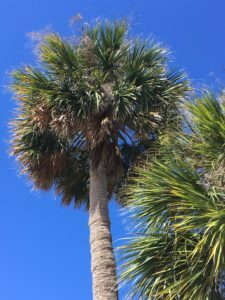 And while the old, dead-looking fronds are still attached to the tree, they are actually providing protection and nourishment for the tree. Do we humans not have enough to do? Do we have to manufacture busywork that not only is unnecessary but actually degrades our environment and quality of life? 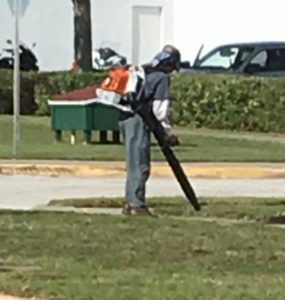 Another example of Stupid Human Tricks (Subcategory “Landscaping Gone Bad”) is the use of leafblowers to blow tiny, barely-visible bits of stuff around sidewalks for hours on end. The noise and fumes carry for blocks, and nothing really gets accomplished. Deep-green living suggestion for today: Find an example of “Stupid Human Tricks” in your area (whether “Landscaping Gone Bad” or any other category of your choice, such as “Outrageous Parenting”; “Nanny Government”; “Stamping Out Beneficial Initiatives”; or what have you). If you’ve been participating unwittingly, make a deliberate choice to withdraw your participation. If it’s a “Stupid Human Trick” perpetrated by someone else, call it out publicly in your neighborhood meeting, City meeting, letter to the editor, or other public channel. Call it out in a way that appeals to people’s self-interest. 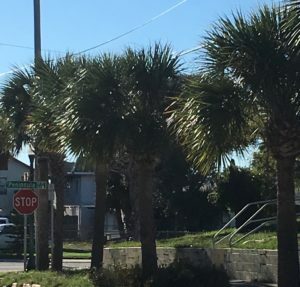 For example (in the case of the palm-tree mutilation), I can point out that it’s a waste of the limited City budget; it causes noise pollution; the gasoline fumes are noxious; or it’s putting workers in unnecessary danger. Each and every one of us CAN make a difference in stamping out stupid. If you can’t get your neighbors, co-workers, etc., to work up any outrage over the “stupid” aspect, try pointing out the “just plain ugly” aspect! By the way, “Stupid Human Tricks” was the title of a segment on the David Letterman Show back in the 1980s. It was pretty much what it sounded like: Silly examples of humans doing stupid stuff. In keeping with Letterman’s show, it was a hilarious segment. But the “Stupid Human Tricks” we see around us each day for real, such as overzealous landscaping, aren’t really very funny at all. They can be deadly serious, in fact.